A wispy eyed burly bloke sniffed behind me as he spoke to his grandsons, who were visiting. I smiled as I turned round to see before me, waves of excited spectators thronging Victoria Square on this cold January evening, puffs of breaths hanging in the air that buzzed with electric anticipation. I, myself, were caught up in the excitement, pleased that on this New Year’s Day that my hometown of Kingston Upon Hull, has finally, after years of agonising waiting, is now UK’s City of Culture 2017. I’m born and bred in Hull, here are the first 18 years of my life attending Sydney Smith Secondary School, the cutting edge that is Wyke Sixth Form College whereas at the same time, I would be exploring the Old Town, going wild at Funjunction, traversing the iconic River Humber Bridge, cheering on Hull FC at the Kingston Communications Stadium, following the history -teaching Fish Trail, seeing a high quality show at Hull Truck Theatre and more. But all of those activities makes me proud to proclaim that I am privileged to be from Hull, one of the major cities of the UK that has seen its fair share of celebration but also sorrow particularly as after London, it was one of the major cities to be devastated in the Blitz of the Second World War. Luckily, Hull has bounced back with a spring in its step, determined to be independent and hold fast to its maritime and fishing roots. What better way to celebrate all things Hull by becoming UK’s City of Culture 2017! 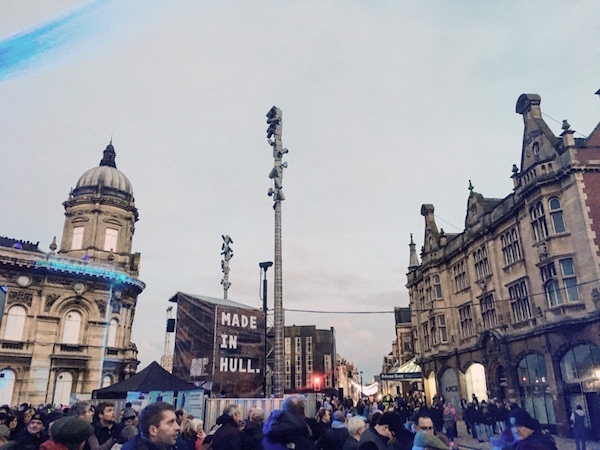 In the lead up to the year, Hull’s residents has held their heads up high, got to work by developing a range of arts and culture events, refurbishing the city centre and promoting to the UK and the world that Hull is open for business and tourism. While I was living at University, in the cities I worked in and even while I was travelling around the world, people would deride me for being from Hull as they believed that Hull was not a good place to live in or visit. But never. I would passionately defend my own city, educating them on why Hull is just simply one of the best places to visit. More and more often these days, I’m pleased to find out that they have visited Hull with an open mind and have come back to me, raving about the city and even themselves promoting why Hull is just a great place to visit. So, it came to 1st January 2017, when all of Hull took a deep breath in anticipation in Victoria Square, the centre of Hull. My, how we roared like tigers. Seeing and counting down, with loud delight, the illuminated countdown on the side of Ferens Art Gallery reach 0:00, we cheered wildly, hands in the air, as the ‘Made in Hull’ light show kicked off on what was going to be an amazing year. The Made in Hull light show installation is available to be seen between 4pm-9pm every day until Saturday 7th January. And guess what, it’s FREE. This is Hull and we welcome you to come visit us to find out about the best of Hull and why we are utterly and so passionately proud. So what is Made in Hull? 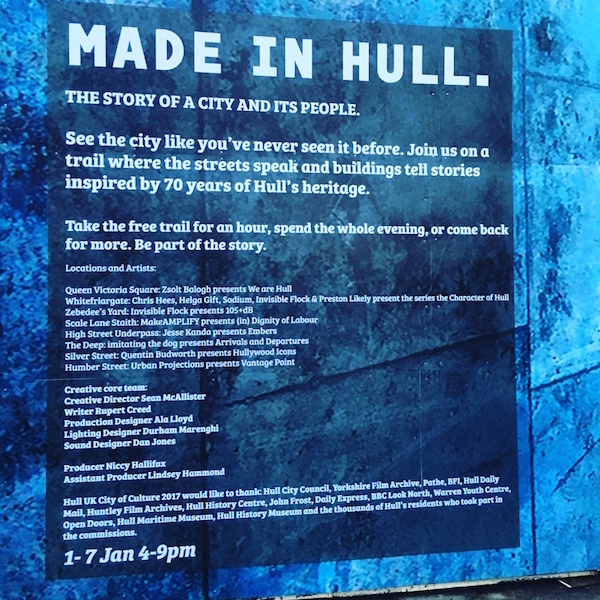 Developed and curated by Sean McAllister and Rupert Creed, Made in Hull is an amazing trail through the city centre where different points speak and tell stories. Hull has never seen anything like this before. The opening event, which I attended, used large-scale projections, illuminated skylines, soundscapes, shop windows and live performances to celebrate the last 70 years of life in the city. 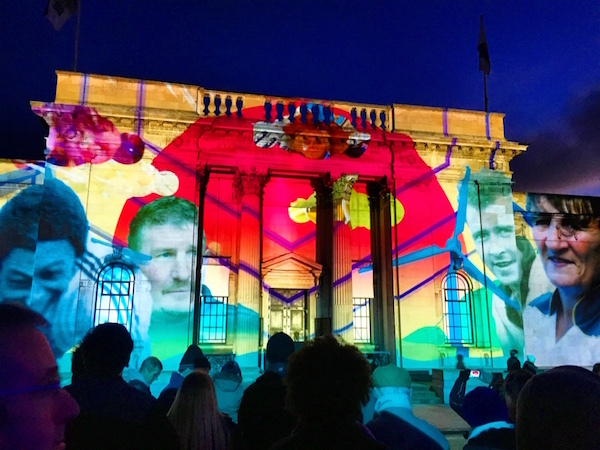 The Victoria Square stage used Ferens Art Gallery, Hull City Hall and Hull Maritime Museum to light up their fronts in stunning spectacular light projections accompanied by music and previously recorded news reels that has been developed by local and international artists. It was absolutely amazing. It told Hull’s story. From the horrific devastation of the Second World War (with the buildings looking like they were on fire with special effects), through the fishing golden period, the good times including the music scene, the bad times of strikes, and what Hull is today, it was a thrilling show to explore Hull’s heritage and its celebrated people. 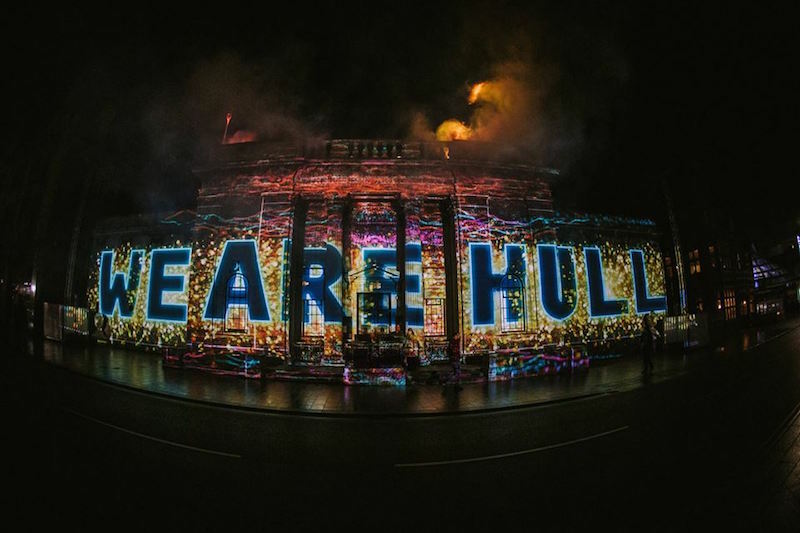 As emotion rolled over in waves across the people of Hull who visibly tried to contain their bursting proudness, the show exploded with a message illuminated on the buildings that really said it all that brought forth wild clapping and frantic cheering from those unable to hold it in anymore. Even I found myself stamping my feet and whooping with delight with a big massive grin on my face. We really couldn’t have said it better. And THIS is how we are going to be for the next 364 days. So, are you ready to come to Hull? You better be. You’re in for a blooming fantastic ride. Here’s how we celebrated the end of the first day of Hull with a roaring display of fireworks over the Marina! So, what other events will I be visiting for the first week of Hull UK City of Culture? 1st January – 31st December – Born into a City of Culture – Hospitals in Hull will be capturing prints of babies’ feet born throughout 2017 to create a unique piece of artwork. They’re been busy, the first one was born minutes after midnight struck! 3rd January – Hull Charters – The Hull History Centre will be telling the story of the first four centuries of Hull through its archives, focusing on its collection of city charters. 4th – 7th January – Pot Luck – At the venue, Fruit, in Humber Street invites people to come to a mystery night that could see you being entertained by film, music, poetry, art and more. But one thing that I’m really excited about that from 13th January – our prestigious Ferens Art Gallery will be re-opening following a £4.5m investment! Cannot wait! Meanwhile, to wrap things up, have you seen the ‘Back to Ours’ trailer? Will you be visiting Hull? Let me know! Its really a great experience to witness a magnificent showcase of fireworks together with our family. Thank you for sharing the video Rexy, its feels that I am there too. No worries! Glad to inspire you! Will you be visiting Hull soon?